If you walk into Wells Fargo Bank in Moraga, you may see a gentleman in a colorful turban. Most immediately recognize that Gulneer Singh Sarang, who goes by the nickname Gary, is a Sikh, not a Muslim. 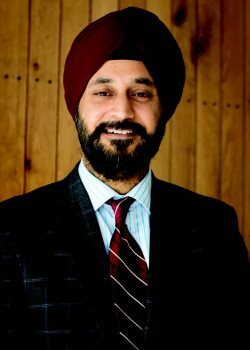 Sarang enjoys educating people about his religion, Sikhism, and he was recently invited to speak to his son's class at Joaquin Moraga Intermediate School. What was supposed to be a 15-minute talk ran to over an hour, as the children asked many questions. Sarang recalled, "They asked why we wear the turban and how long is my son's hair?" The students were curious about arranged marriage and asked many general lifestyle questions. Sarang was prepared with slides and notes. "They were very interested in where the religion originated and about the Gold Temple. Founded by Guru Nanak, who was born in 1469, the Sikh religion is dedicated to helping the oppressed," Sarang explained. 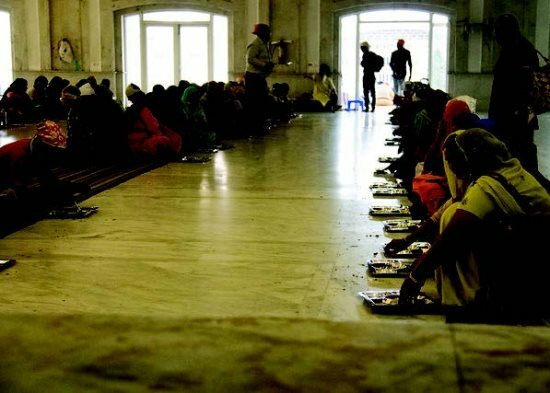 "Sikh temples are called Gurudwara, and they offer food to anyone who is hungry. There were lots of questions about the service of food at the temple: Why do they do it? Who donates the food?" Sarang said that many people will come in and make large contributions in cash and in kind (food). As Sarang explained to the students, the Sikh religion is monotheistic, and respectful of other religions, believing that they are all seeking god. Like other Sikh men, Sarang wears certain ceremonial items, such as a bracelet, in addition to his turban. Some men wear short knives that represent the swords with which Sikhs defend others who are in danger, but Sarang does not. The turban Sarang wears is about 15 feet of fabric, and it takes him some time in the morning to bind up his long hair into the turban. Sarang was born in Amritsar, a city of a little over a million in population in the Northern province of Punjab in India. Punjab is home to most of India's Sikh population, and the famous Harmandir Sahib (commonly known as the Golden Temple), the spiritual and cultural center for the Sikh religion. The site attracts more visitors than the Taj Mahal, with more than 100,000 visitors on weekdays alone. As at other Sikh temples, visitors are welcome to partake of a meal prepared by volunteers from donated food. A very family-oriented man, Sarang believes in family values. He says that their primary value is humility and sincerity. "My wife and I teach our children to lead truthful lives and to be of service; we remind them that they are ambassadors of their religion." He added, "The tenth Guru, Guru Gobind Singh ji, mandated the Sikhs to wear the turban. This gives Sikhs a unique identity that promotes equality and righteousness. Our actions and success will be representative of our culture and people." Sarang and his wife teach their two children that happiness doesn't come from materialistic goods, but "if you are happy, you will automatically be successful," Sarang believes. Sarang grew up in New Delhi and attended private school before studying business at the University of Delhi. The family first visited the U.S. in 1989, and then Sarang returned in 1995 to pursue a master's degree, but had difficulty getting his bachelor's degree recognized, so he wound up back in India, where he obtained his advanced degree from the International Management Institute and then started on a career in banking and financial services. He returned to the U.S. in 1999, working for Providian in Pleasanton, and later, for Morgan Stanley. On Sept. 11, 2001, Sarang was in Manhattan for training on the 62nd floor of the World Trade Center south tower. He was making coffee when his attention was drawn to a blizzard of papers outside the windows. "And as I looked," he remembered, "I saw that the papers were on fire." Told to evacuate via the stairs, Sarang was walking down. "When I reached 47th floor," he said, "there was a tremendous bang like nothing I'd had ever heard and the building swayed as though it would collapse." That was when the second plane slammed into the building around the 60th floor. "You don't run down 62 flights of stairs," Sarang said. "It was very orderly, but unreal. They directed us to the subway level and told us to walk away. I walked two blocks before looking back and seeing the building collapse like a pancake," Sarang recalled. Sarang emphasized how kind the company was to them. "First they put us up in a hotel. They provided counselors, food, and offered transportation home. "Having gone through the experience of 9/11," Sarang observed, "it further cemented my view of the unpredictability of life. How safe are we, how long will we live, does it really matter to be just financially successful, what about my family what are they going through ... are some of the questions that were repeatedly pounding my brain. "My older brother who was then in Fremont, California, was a mental wreck till he had heard from me directly several hours later. That day it did not matter whether we were in New York, the hub of the world's financial activity, what car we were driving or what we looked like. I looked different, but no one aimed a racial slur or any rage towards me. Everyone wished to be safe and happy to be with their loved one. At the end of the day, that is exactly what really matters in life." 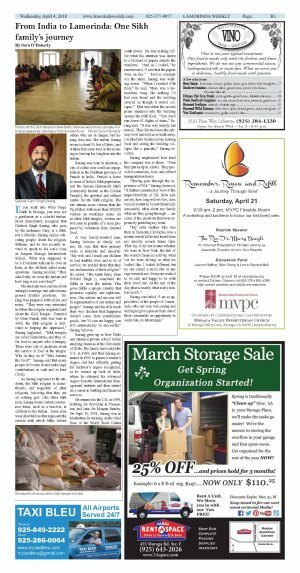 Sarang concluded, "I am so appreciative of the people of Lamorinda, who are very welcoming and willing to give a person from out of their community an opportunity to assimilate, to intermingle." 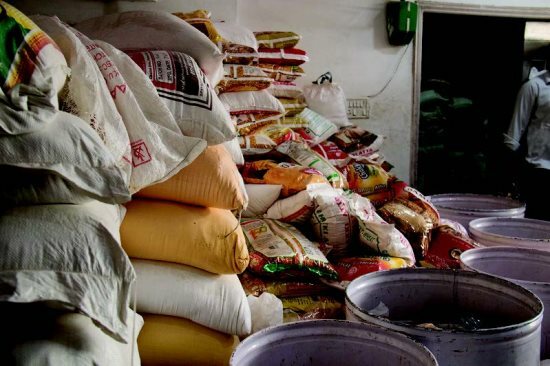 Donated food stores at this Sikh temple in India.